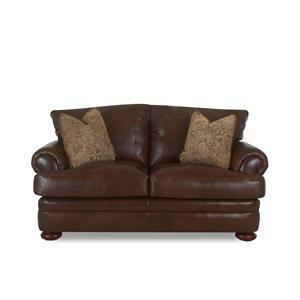 Relax after a long day at the office in this plush, leather chair. 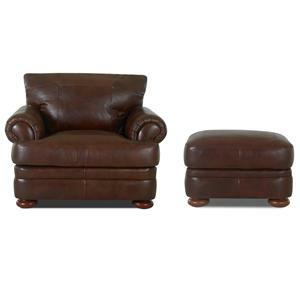 The perfect piece for your living room or den, this chair instantly warms your decor with its rich, supple leather upholstery. 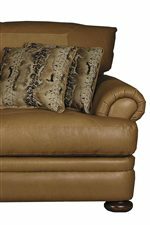 Enjoy the supportive feel of a down blend cushion while watching television or simply lounging around. Featuring wood bun feet and gently rolled arms, this chair combines the best of Casual styling and sophisticated materials. Available in several different leather colors, find the look that best suits your own personal design style. Optional nailhead trim accents create a bold alternative in the 43800-10 series chair. 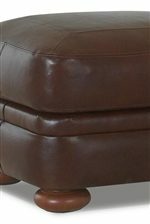 The Montezuma Leather Casual Style Chair with Bun Feet by Klaussner at Hudson's Furniture in the Tampa, St Petersburg, Orlando, Ormond Beach & Sarasota Florida area. Product availability may vary. Contact us for the most current availability on this product. Seat Back Attached seat back. Leg or Skirt Exposed wood bun feet. The perfect mix of sophisticated materials and casual styling, the Montezuma collection adds a luxurious look into your home that everyone can enjoy. Whether lounging with friends, or relaxing after a long day at the office, the Montezuma collection provides you with supportive and soft, down blend cushions and gently rolled arms. 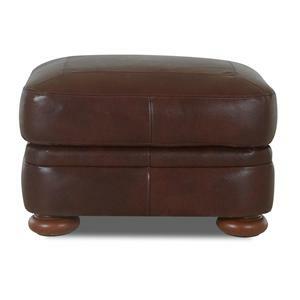 Wood bun feet and amply stuffed cushion backs give the collection a unique look to appreciate for years to come. Available in several leather colors, find the look that's right for you today! 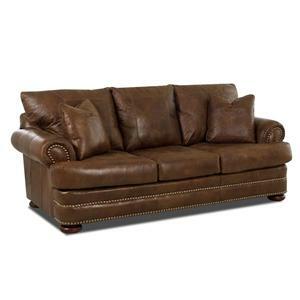 The Montezuma collection is a great option if you are looking for Casual furniture in the Tampa, St Petersburg, Orlando, Ormond Beach & Sarasota Florida area. Casual Styling and Luxurious Leather Combine in this Collection. Wood Bun Feet Add a Casual Look to this Collection. 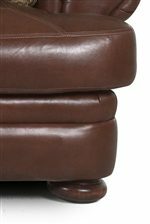 Plush Cushion Tops Provide Maximum Comfort. 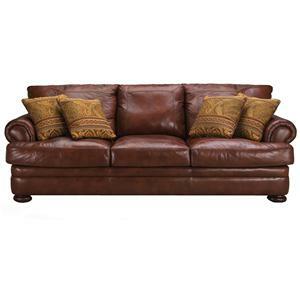 Browse other items in the Montezuma collection from Hudson's Furniture in the Tampa, St Petersburg, Orlando, Ormond Beach & Sarasota Florida area.